“Come on, I have to show you something!” Bonnie grabs my arm and steers me down her driveway. My childhood friend has traveled Europe and sailed the Caribbean, she has lived in the tundra, prairies, and mountains. Now she is here; showing me around her scrubby acreage surrounded by huge tracts of farmland and swamp. I scan the property but can’t see anything promising. Maybe there’s a hidden gully nearby. Or perhaps a steep ravine with an icy brook? I look down the length of road in both directions and finally back at her. We are standing in a ditch, and not a very wide or especially deep one. I am not sure how to respond. I realize I was expecting something more; something not so, well, ditch-like. “Yeah, your kids must love it,” I say, hoping I sound sincere. Her enthusiasm baffles me at first. Alpine vistas and ocean shorelines are one thing, but a snowy ditch? Ditches are as banal as my back alley, yet she speaks like an explorer reporting on a thrilling discovery and the way she honours the ground we stand on, instead of pining for distant places, makes me wonder what I might discover in the margins of my own every-day environment. We turn around and head inside, but not before I glance back at Bonnie’s inspiration; a dip of land between pavement and frozen pasture. *I wrote a longer essay, with the above story nested inside it, several years ago. Last fall, after reading a call for submissions for flash non-fiction pieces under 350 words, I slashed, chopped, and whittled away at my original essay until I found what I am sharing here. 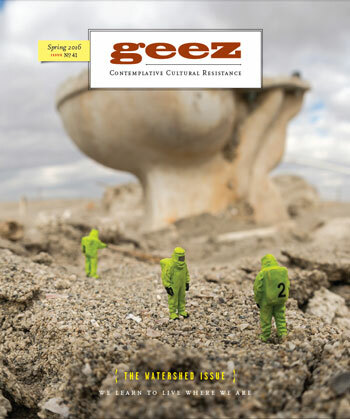 This flash non-fiction piece first appeared in Geez Magazine (41), Spring 2016, The Watershed Issue. Click here to find out more about Geez. On a different note, look who is coming to Wonderscape! Head chef of The Backyard, Mariana Brito hails from Tijuana, Mexico, where she attended the Escuela de Arte Culinario before training in Spain, New York, and South Carolina, under chefs of Michelin starred restaurants. Joining her global background with a passion for organic food and her strong relationships with local producers, Mariana centres the flavours of modern Mexican cuisine in the landscape of the Canadian prairie. Every ingredient is fresh, ethically sourced, and organic whenever possible. Come to one of the nature-based creative arts retreats I facilitate!